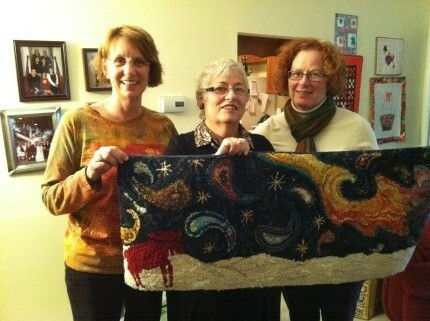 My sister, Pat Holly and I lectured and taught for the Indianapolis Quilt Guild in mid-January. We were fortunate to have great travel weather both ways! It is always a concern when driving to events in the winter. 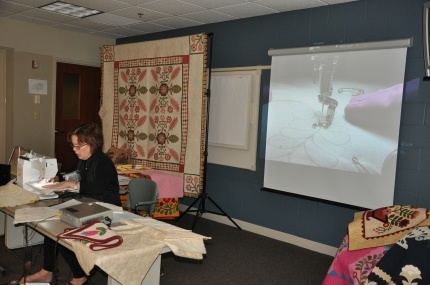 We gave our lecture on how we collaborate on quilts, the group seemed to enjoy our history! 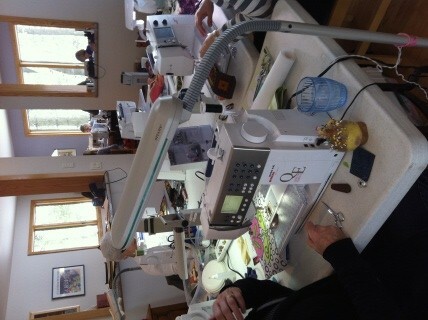 We then taught two days of machine technique classes to very enthusiastic students. 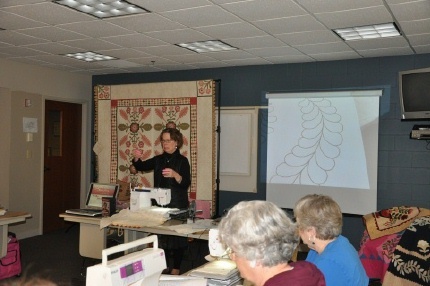 I am explaining how I stitch the feather design. 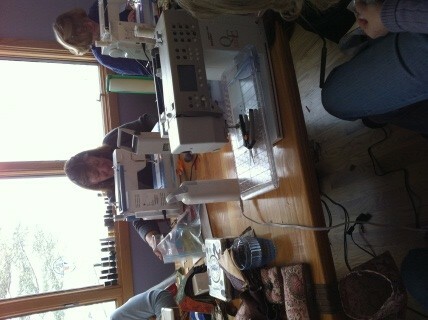 I am showing how I stitch the feather… exciting stuff! More good information for the group! Pat and I had a wonderful dinner at our friend Mary Anne’s home and our friend Pat joined us.. Mary Anne and Pat are Beaver Island buddies from way back, having all attended Gwen Marston’s retreats in northern Michigan for many years. It was good see them on our trip to Indianapolis! 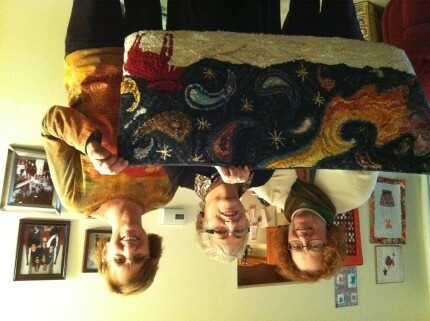 We had a great visit with the Indianapolis Quilt Guild! 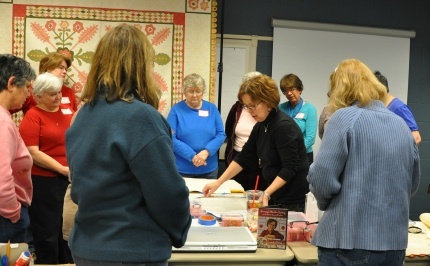 I was also excited to have a personal retreat with my own quilting group- I have been part of Tuesday Night Friends for 29 years! It was 4 days of non-stop sewing…. 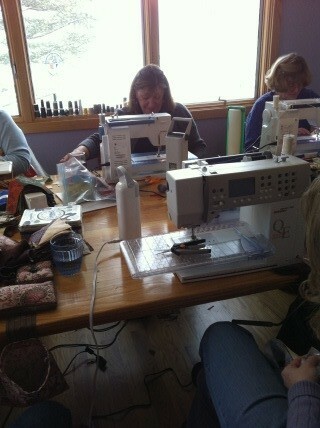 Sewing with our wonderful Bernina Sewing Machines! 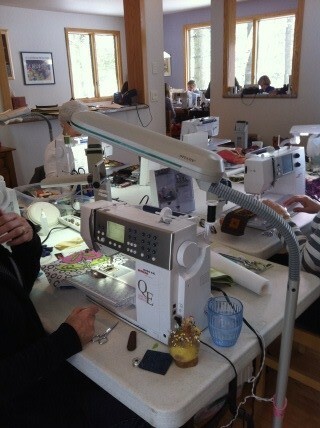 and more Bernina Sewing Machines! 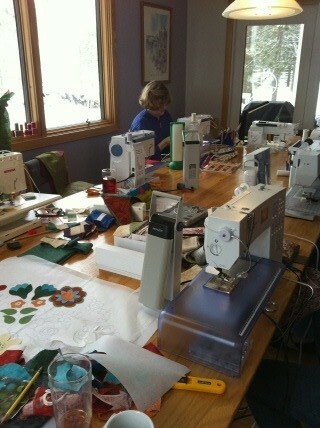 Wow, that’s a lot of Bernina’s! I couldn’t help but take photo’s of our group and our machines! This entry was posted on Saturday, February 12th, 2011 at 1:19 pm	and is filed under Uncategorized. You can follow any responses to this entry through the RSS 2.0 feed. You can leave a response, or trackback from your own site. Welcome to the world of blogging! 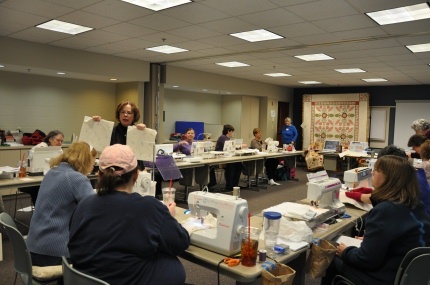 I have enjoyed two of your classes in the past and look forward to reading about your travels and future classes and to your report from the Elly Sienkiewicz Applique Academy. Hi Sue! 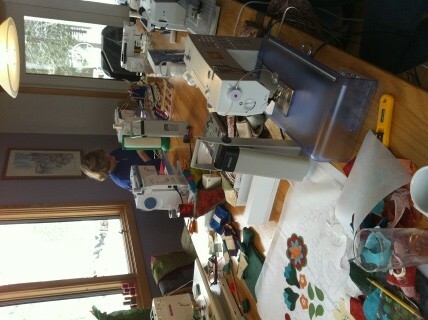 Just had a blast at your machine applique class in Colorado. Cant wait to start a project using the techniques. Hope you had a good trip home! Thanks much!